PRESSURE has landed on the shoulders of the pint-size Honda Jazz. But the sporty and muscular little hatch looks like it has the goods to handle the sales burden. Honda believes the third-generation Jazz has the ability to carry it back into the segment leading position with prices from $14,990, revised interior and exterior styling, increased sound-absorbing material, increased aerodynamic performance and a redesigned suspension system. The Jazz has increased in length but has lost 25kg over the previous model, while the standard equipment list has grown substantially. Interior volume is up by 139 litres courtesy of an 80mm increase in load floor length and rear legroom is up by a healthy 115mm. But it's the exterior look of the Jazz that is the most notable - the company has pushed for a sporty feel, with an extremely angled look around the front and rear lights and sculptured panels. Inside the car gets a technological makeover thanks to a touch-screen infotainment unit that includes a reversing camera screen, plus a cleaner, more mature dash. The standard features in the Jazz are impressive. The entry-level VTi has the 17cm touch-screen, four-speaker CD stereo, Bluetooth phone and audio connectivity, two USB plugs, cruise control and sits on 15-inch steel wheels. Step up into the VTi-S and it gains 16-inch alloys, front fog lights, side skirts, a 12-volt console plug, leather-wrapped steering wheel and gearshift knob, premium fabric trim, six-speed audio and alarm. Getting into the $22,490 range-topping variant adds leather seat trim, heated front seats, rear parking sensors, a rear-seat centre fold-down armrest, smart entry and push-button start, along with a tailgate spoiler. Safety includes six airbags along with the likes of stability and traction control, hill-start assist and a rear-view camera. Carried over is the popular "Magic Seats". Courtesy of its centre-mounted fuel tank, the rear seats can flip and fold in 18 different ways for a massive cargo space. 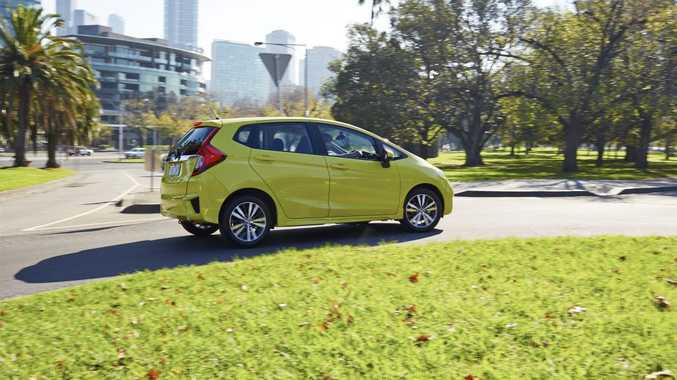 "This all-new Jazz is an important model for us and we are confident our customers are going to love it as much as we do," Honda Australia director Stephen Collins said. "Its fun-to-drive character, versatility, state-of-the-art connectivity and long list of standard features are packaged brilliantly in a new, sporty design with a range of vibrant colours that will definitely appeal to our younger customers." Details: Five-door front-wheel-drive compact hatch. Engine: 1.5-litre four-cylinder petrol generating maximum power of 88kW @ 6600rpm and 145Nm @ 4600rpm. Transmissions: Five-speed manual or continuously variable automatic. Consumption: 5.8 litres/ 100km (a); 6.2L/100km (m). Bottom line plus on-roads: VTi $14,990 (m), VTi $16,990 (a), VTi-S $19,790 (a), VTi-L $22,490 (a).